Everyone will want to know where you found this unique piece of artist-made jewelry! A fine slice of honeycomb has been permanently preserved in Bronze using the lost wax process. These bronze pendants are lightweight and very comfortable to wear. The comb measures 1" x 3/4" and looks delicious when worn! Bronze has a warm honey gold tones that really come to life in the sunlight, each is sealed to prevent tarnishing. These handmade necklaces come with care instructions and each is packaged in a pretty presentation box. I have provided a variety of images with different light sources, bronze looks different in indoor lighting vs full sunlight, these variations are part of the nature of bronze. These handmade necklaces come with care instructions and each is packaged in a pretty presentation box. Hangs on a 20" raw red brass chain as pictured. * Red Brass is solid brass with a warm copper hue to it, it is not actually "red". These are made using traditional metal working techniques in our Austin Texas studio, and registered with the US design copyright office, this is both an original honeycomb and an acknowledged work of sculptural art. *** All of my newest designs are only available through ChaseandScout.com, this Etsy shop contains just a small selection of Chase and Scout classics. Blending the beauty of the dark and the light, Chase & Scout jewelry is created using traditional metalworking techniques with an intention to last a lifetime and beyond. C&S has been featured in Austin Monthly, Tribeza, Haute Macabre, Dark Beauty magazine, Dirge and other publications. Our designs are available in select galleries within the US. Everything by C&S is proudly and entirely created in Austin Texas. 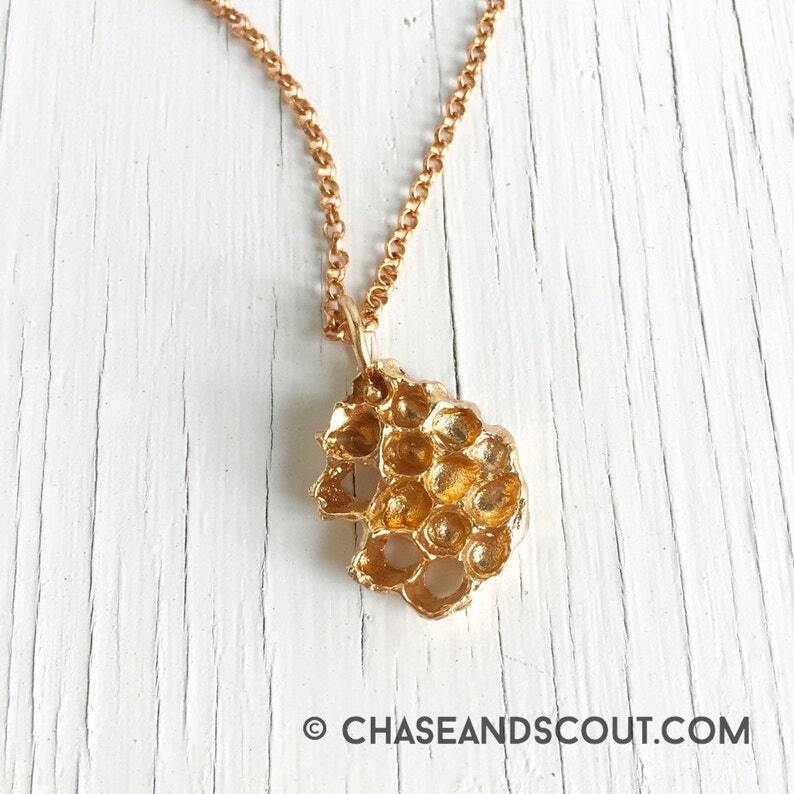 All Copyright of jewelry designs (and photos of designs) belong to and are registered to Chase and Scout. Purchases of jewelry does not grant the right of reproduction. Design copyrights are always filed with the US copyright office. Stylish and very well made, such a neat piece. My wife loves it! Beautiful necklace. Seller was easy to work with. Bee-utiful. Gave this to my sister (concerned bee activist) for her birthday. She LOVES it and says she is wearing it everywhere.